Who are the largest dragons in fantasy? Be warned, this chart contains dragon size-related spoilers for A Song of Ice and Fire. 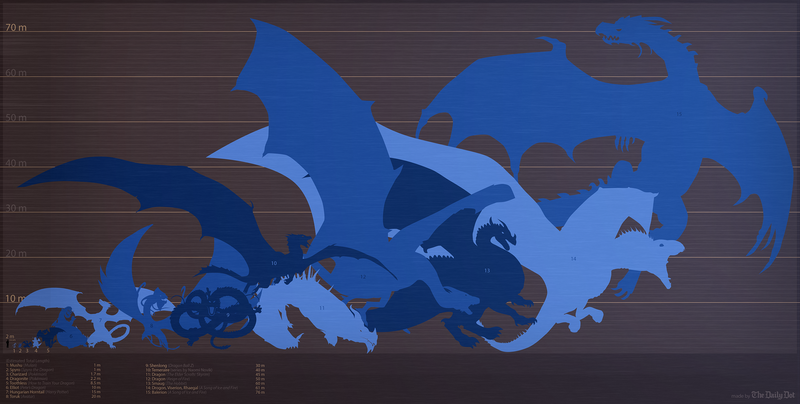 The folks at the Daily Dot made this (not comprehensive) size comparison chart, starting with Mulan's tiny Mushu and going all the way up to the legendary Balerion from A Song of Ice and Fire. But how did they get all these measurements? Head over to the Daily Dot to read about their methodology and to see another view of their chart, broken up into smaller dragons and larger ones.